Susan Heim on Parenting: Master Lock’s Tips to Keep Your Home and Family Safe During Vacation, Plus a Giveaway for a Key Safe! Master Lock’s Tips to Keep Your Home and Family Safe During Vacation, Plus a Giveaway for a Key Safe! 1. Secure all points of entry to your home, including dead-bolting doors, windows, sliding glass doors and garage/shed doors to bolster your home’s security. If you have an alarm system in place, be sure it is activated before departing. Leaving just one of these areas open or unlocked can lead to theft. 2. Keep your home active. Whether you’ve hired a dog walker or a neighbor is headed over to water plants and pick up deliveries, ensuring your home still appears to have people coming and going regularly can deter thieves. 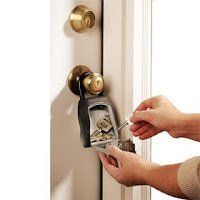 Store your house key in a key safe such as the Master Lock 5400D Key Safe to allow these individuals to easily enter and exit your home, locking it up as they leave. Make sure these approved visitors know the code to your home alarm system, if applicable, so they can deactivate it and reset it after finishing their tasks. If you do not have anyone visiting your property while you’re away, consider placing lights on a timer and stopping your mail delivery by visiting www.usps.com. 3. Lock up your luggage. Airports are full of people and distractions. Items can be easily stolen from bags while awaiting your flight’s departure, or before you pick up checked luggage from the baggage claim area. A TSA-accepted lock like the Master Lock 4688D luggage lock will help keep your possessions safe while in transit and allow you to move through security lines with ease. 4. Secure important items in your room. Whether you’re staying in a hotel, cabin or resort, it’s important to lock up valuables when not in your room. A secure document storage or cash box will help ensure your passport, traveler’s checks, cash and jewelry safe while you and your family enjoy the sights and sounds of your destination. If you’re taking your small valuables out and about with you, consider a Master Lock 5900D Safe Space to keep your belongings secure while you’re on the go. 5. Create an emergency plan. It’s no doubt you will have several activities planned throughout the course of your vacation. In the event that a member of your family becomes separated from your group while out and about, each individual should have a list of important numbers as well as a plan detailing how to reconnect with the group. 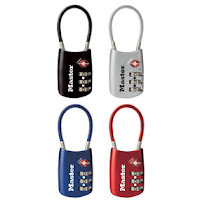 For more information on security solutions, please visit Master Lock’s website at www.masterlock.com or the Master Lock Facebook page at www.facebook.com/masterlock. Visit www.masterlockvault.com to utilize the free, secure online data storage application and download a smart phone app for easy access on the go -- an ideal place to keep important bank account and other information for emergencies while on vacation. Everyone knows that leaving an extra key under the doormat or a nearby rock is the first place that thieves will look! This is an awesome way to have access to extra keys without making it easy for others to get to them. 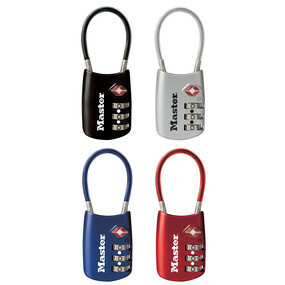 MANDATORY ENTRY: To enter, visit www.masterlock.com and check out all of the terrific security products by Master Lock. Leave a comment on this post with the name of another product that your family would find useful! You must do this to enter the giveaway. One winner will be randomly selected from the qualified comments received by Friday, September 9, 2011, at 11:59 PM ET. Please leave an email address on one of your comments if it’s not available on your Blogger profile. Winner must respond within 72 hours or another winner will be drawn. Contest is open to US residents only. CONTEST CLOSED. Congratulations to the winner: Natalie A.! DISCLOSURE: I received a product sample as a thank-you for sharing this information, but no financial compensation was provided. We could certainly use a steering wheel lock, looks like they have a few good ones!! my family could use a set of luggage locks that actually worked and weren't easy to pick! Their towing/hitch locks are fantastic. So great for keeping your boat/bikes/etc safe! i'd like the shrouded padlock. I like the Combination Padlocks! Thanks! I entered the Dreamgenii Pregnancy Support and Feeding Pillow GA! I like the looks of the No. 5900 Set-Your-Own-Combination Portable Safe for small valuables. We could use of luggage locks for our suitcases. I never knew Master Lock made ratchet straps. We definitely use them around my house. We could also use the Storage Security (lock boxes). We aren't very secure people. I'm not sure why. I think it's because we live in the country. I hope my mandatory entry went through. I said lock box. I am having internet problems. Ugh. Like Master Locks on FB. The security lock box would be handy. I would like to have something like the Storage Security - No. 7120D (a storage bag). It would be good for keeping cash on hand at home. I LIKE MasterLock on Facebook. I entered the It's Raining Money giveaway. Would love the Password Plus Combo Lock too! I am a facebook fan of Master Lock (Marysa N). I think the Assorted Colors - No. 1500iDPNK lock would be useful. My family goes to a gym and there are never enough locks available there. I Like Master Lock on Facebook. I already Like Susan Heim on Parenting on Facebook. I already Follow @ParentingAuthor on Twitter and tweeted about this giveaway. A Laminated Padlock would be perfect for locking up our garage. The personal safety pepper spray. I'm paranoid about stuff like that. I like the Breast Cancer Lock. Also could use a ulock for my bike. Cable Lockout - No. S806 would be very helpful for my family! I would get a Master lock deadbolt for my front door. I'm also impressed with the Master Lock Vault. I could really use a hitch lock too! I like the towing/hitch locks. I entered the FyrFlyz Giveaway!